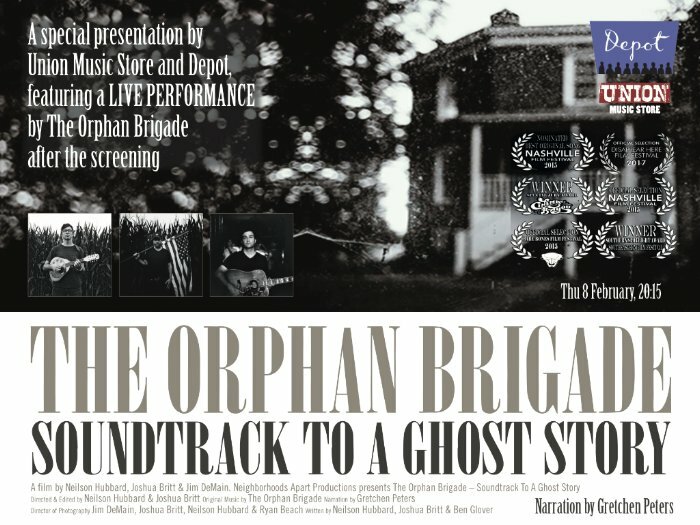 THE ORPHAN BRIGADES 'SOUNDTRACK TO A GHOST STORY' at the DEPOT CINEMA, CAFE & RESTAURANT, LEWES. Having lived for nearly 70 years on this beautiful but troubled little third rock from the sun (the previous 100 or so were spent on my home planet of Zog, but it's nice to travel) I've never felt the desire or the belief to saddle myself with a lucky number. After Thursday night's experience I may well change my mind and adopt the number 34. Why 34 you might ask? The answer is that I was one of the fortunate 34 souls who attended the first public showing of The Orphan Brigade's 'Soundtrack to a Ghost Story' documentary at Lewes's new Depot cinema, restaurant and cafe. The event was co promoted by the theatre and Stevie and Jamie Freeman of the Union Music Store, the film having been premiered at the Americana Music Festival Conference and Awards in London a week or so ago, an organization of which Stevie is the Chief Executive Officer, so we were incredibly lucky to see this beautifully made and thought provoking documentary. At the moment there is no proposed general release date for this excellent film that was shown at the most comfortable cinema/ music venue it has ever been my pleasure to spend an evening in. I include the term 'music venue' because following the showing of this one and a half hour documentary we were treated to a short set by the core membership of the hugely talented 'Orphan Brigade.' The seating in the theatre will put that which is in many people's homes to shame and I was able to relax my 6' 4" frame into seating so comfortable I would have been content to spend the night there, although the same cannot be said of the 'Octagon Hall' the location for the making of the album and documentary! 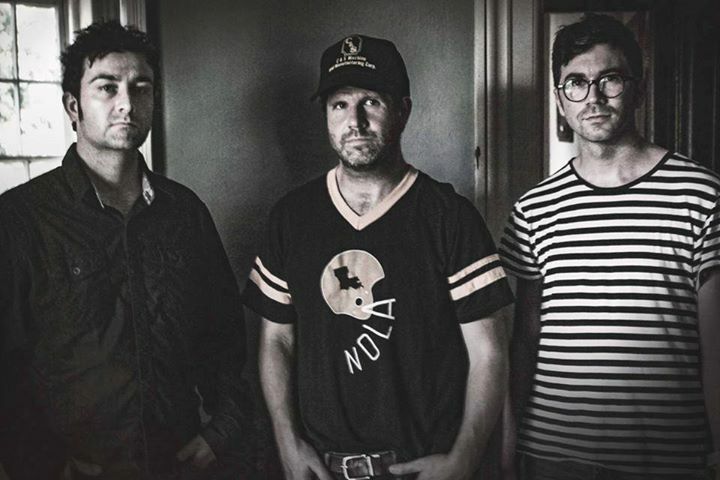 The band consists of U.S domiciled and hugely talented Irish born singer songwriter Ben Glover, a man who sounds as good live as he does on record and who writes his songs from the heart rather than just churning out unimaginative pop songs. As a musician he is as skilled at modern day Americana, folk, alt. country as he is traditional Irish music as you would expect from a man who has such a huge depth of feeling for everything he throws himself into. He was joined by vocalist and gifted mandolinist, (and much more!) as well as a member of the tremendous 'Farewell Drifters,' Joshua Britt, a man whose uncle is Director of the 'Octagon Hall' in Kentucky where the album was made and the documentary filmed and whose vocals helped enhance the emotional depths of the often astounding album. The final cog in the trio is Neilson Hubbard, another hugely talented singer, songwriter and now producer whose first solo album 'The slide project' is still, more than twenty years after its release, a fairly regular visitor to my c.d player. To give a very basic background, the Octagon Hall is a 160 year old plantation house in Kentucky that was the scene of much horror and tragedy in the American Civil War. At one stage the 'Orphan Brigade' a band of Confederate soldiers lived, fought and often died there, and from my basic understanding was in the very heart of the fighting, hence their name. The family that owned the house had more than their fair share of tragedy, one of the heart rending events being the death of their little daughter when her dress caught fire. Many of the horrific events are part of recorded history but even more have gone completely unrecorded, as a consequence of which the house, which is eight sided as the name implies, is known as the most haunted house in the southern United States. The songs were all written and recorded in the house over a period of a year or so with the documentary crew spending much of the time filming. There were too many unexplained events during that time to document here but a number of strange sounds and visions were recorded and filmed, with most appearing to be inexplicable. These events and the atmosphere of the house fairly obviously had an effect on the film crew and musicians, with a great deal of eeriness in some of the explanations and descriptions, making this a hugely intriguing tale. Even leaving out the location and the stories associated with it the album and band deserve to be heard by much bigger audiences simply because of the huge talents that were and still are involved. A number of other musicians were included in the sessions as will be seen by all those who buy the recording or see the film, although there is currently no budget or distributor for the film's release, which is a travesty because it is an excellent record of the making of an album as well as being a wonderful documentary of the history of a house that has a tragic background, the structure of the building even having a strange deeply melancholic appearance on the film, similarly the haunting album. Following the film the Orphan Brigades short set included songs from the album as well as its excellent follow up 'Heart of the cave,' another haunting recording, this one made in a cave system in Italy. As I've already said the trio contains three incredibly talented musicians and it was nice to hear some stripped down versions of their songs. Joshua played mandolin, Ben, guitar and Neilsen, drums, with Ben taking most of the lead vocals and the other two supplying some tremendous harmonies. For the final song of the night, the exquisite Pale Horse, the trio came down into the audience and with just the guitar and mandolin put on an unamplified, emotion charged version of this beautiful yet equally harrowing song. Neilson's hushed but atmospheric lead vocal set the song up but when the other two came in on harmonies on the soaring chorus the atmosphere that was created seemed to reach above even that of the record. I don't know where or even if the documentary will be shown anywhere else but if it is go and see it. You will find it to be an absolutely fascinating hour and a half. As to seeing Orphan Brigade live, that is an absolute no brainer. Knowing their albums and the depth of the songs and production intimately I wasn't sure what to expect from a live performance as an acoustic trio. I needn't have worried, the quality of the compositions, the musicianship of the trio and the stripped down acoustic setting actually enhanced the power of the songs. A link to my review of the 'Soundtrack to a Ghost story' album can be found below and it still amazes me that music of this quality didn't trouble the chart compilers upon its release. Take my word for it; this is a great album by an extraordinarily gifted band.